The following vision was shared with me by my good friend David Davenport. Indeed David is a prophetic scribe—an anointed wordsmith of sorts, who hungers for the deep things of God’s heart—he has a knack for utilizing the right words to communicate the Reality of biblical truths. 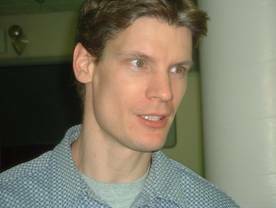 David is an ordained member of MorningStar Fellowship of Ministries, a graduate of MorningStar School of Ministry, and a former member of MorningStar Fellowship (Charlotte, NC). He is someone that I can wholeheartedly recommend if you're looking for a humble vessel to come minister to your flock. I saw a massive train yard. 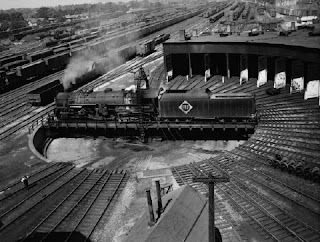 In the middle of the train yard was a turntable that re-directed locomotives and boxcars. Surrounding the turntable were many different tracks—leading in every direction. Many locomotives would pull an enormous train of boxcars to the turntable, detach from the cars, drive onto the turntable, turn in a completely different direction, and then re-attach to a new trail of boxcars (train). Some distance from the turntable, I saw many locomotives and boxcars that had sat stationary for some time. Though they had collected dust, they were very sound mechanically, as they were regularly serviced as they sat, that they would be ready at a moments’ notice to be dispatched to any of the countless tracks heading in every direction. Toward the end of the vision, I could hardly believe my eyes at the enormity of the train yard, as the expanse was beyond what the eyes and mind could fully comprehend. It was during the vision that I realized the completed trains were churches and ministries. The turntable represented new relationships, new associations, new directions and new partnerships unfolding in the Body of Christ abroad. I also understood the stationary or inactive locomotives and boxcars to represent Saints who had been placed in “service bays,” to be re-tuned as the result of long-overdue rest, restoration and healing. Many of these had, over time, very subtly drifted into nearly unshakable postures of sadness and despair, as they had faced many fiery trials in their previous courses. They had witnessed and experienced measures of warfare that left them deeply wounded, numb and despondent. For they had encountered false brethren, tares among the wheat, and wolves among sheep. They were disillusioned, as they had come to realize that the worst warfare they had faced to date was that within the Body of Christ. They had begun to doubt that they would ever again wish to re-engage their gifts and ministries. They had begun to doubt that they would ever see the truly Glorified Church, moving in authentic power and transforming entire cities and nations. However, these saints were rapidly approaching re-deployment. In fact, most of these “resting and healing” boxcars and locomotives were surprised and caught off-guard, as they were unexpectedly called upon to deploy—suddenly. Though caught off-guard, they were yet ready for service, more ready than they realized, and they moved toward the turntable with strength, resolve and confidence—beyond any measure that they had walked in previously. As I looked toward the skyline in the closing moments of this vision, I saw a massive calendar. The heading of the calendar read, “8 – August” (or, “8-8”). As I have prayed about this vision over a long period, I have come to believe that as 08-08-08 unfolds, the Holy Spirit will be imparting specific direction, confirmation and affirmation to the steps of many of His Saints, with respect to critical and vital relationships, partnerships and directions in ministry. To those that are in a place where they are to plant-roots and delve deeper into the ministry or church in which they find themselves presently, deeper relationships will occur. As well, new relationships will be birthed. New levels in gifting and anointing will be poured-out. Restructuring and repositioning of members of given ministries and churches will be quick, decisive and will be carried out with precision. To those who have felt an impending change on the geographic horizon, vivid dreams will occur. Signs will be given; relationships will be birthed suddenly and unexpectedly, and will represent links to entirely new directions toward ministries and churches in different locales. I believe the heightened activity level within this context, is that in preparation for the times that are quickly unfolding before us. I believe that events will unfold in 2008 that will require the Body of Christ to be planted decisively, and with unyielding resolve, in places and positions of service that are tailor-made for our individual gifts and callings. I believe that the key to seeing the signs and hearing the voice of the Holy Spirit in this hour, and specifically with respect the approach of 08-08-08, will be that found within the practical and prayerful application of John 5:19 and John 5:30. In John 5:19, Jesus declared that He only did what He saw the Father doing. In John 5:30, Jesus declared that He only did what He heard the Father saying. In this context, I believe it is critical in this hour, and at this very moment, to adopt the prayer that asks for “the eyes to see” and “the ears to hear” what the Father is doing and saying to each of us, with respect to the massive turntable that many of us are rapidly approaching as we move into 2008. I have prayed that all who find receipt of this word would be quickened with a call to discern the rapid changes approaching each of us as 2008 unfolds. over the past ten years the train images have been growing stronger and stronger... in Canada, the train is the one piece that linked our nation as a whole. there is so much to this train thing... this past fall we had two prayer gatherings for young leaders from across the country... we gave each one of them railway spikes which we had found in an old abandoned coal mining town called bankhead... I've been praying over this train thing for years... a number of us nailed those spikes into our backyard representing various places coast to coast, and specifically at that time, the work of 24-7 prayer in the country. Thank you for sharing your journey as it relates to the prophetic symbolism of a train. Very interesting what you shared concerning the spikes. The vision was originally in '05. David writes, "Shortly after I had the vision, I conducted an exhaustive search on the web, for train yard photos. I ultimately found a photo that was the very vision I had...I then circulated this vision to a large group of friends, and it had an impact on them as 08-08-05 transpired. It was not until early '07 that I begin to feel that the vision had much larger context for '08." I hope your family recovers swiftly from your trip! I'll have to check your blog to learn more about it. Also we have Pete Greig coming in this weekend for our Awaken the Dawn conference. I'll be working with him as he shares the Campus America vision.